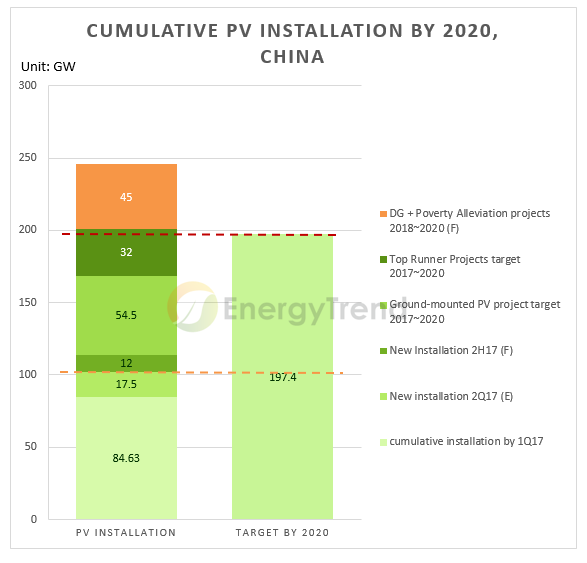 China has targeted installing 86.5GW PV capacity during 2017-2020 under the 13th Five-Year National Development Plan, including 54.5GW for ground-mounted PV projects and 32GW, or 8GW a year, for PV projects under the "Top Runner Program," according to the latest policy released by the National Energy Administration (NEA). Plus the installed capacity in the first half this year and distributed generation (DG) capacities and poverty alleviation projects, the accumulated installed PV capacity by 2020 under the 13th Five-Year Plan period will top 250GW, forecasted EnergyTrend. The aforementioned targets for PV projects don't include DG PV projects, poverty alleviation projects, as well as PVprojects in Zhangjiako City. Installation plans are held back for the time being for Ningxia, Xinjiang, and Gansu Provinces, due to the grave problem of PV electricity curtailment. Targets for several municipalities will be handled by themselves, including Beijing, Tianjin, Chongqing, Shanghai, Hainan, Fujian, and Tibet. 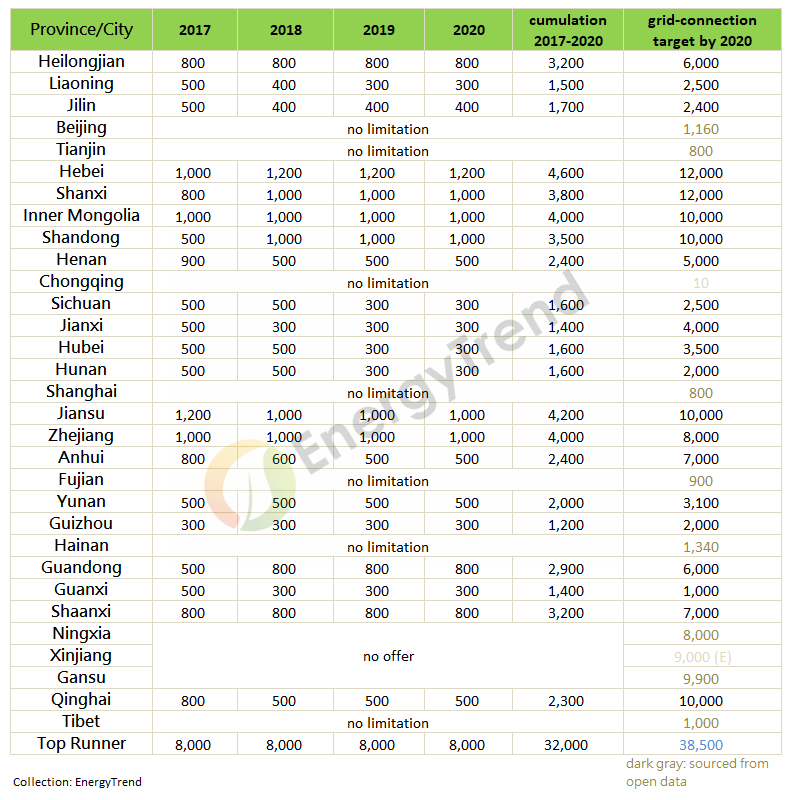 Meanwhile, provinces that have applied for extra 2016 subsidy for capacities of over 500MW, which are Hebei, Shandong, Henan, Jiangxi, Hunan, Hubei, Yunnan, and Guangdong, should allocate all these extra capacities for poverty alleviation projects. Provinces that have applied for extra 2016 subsidy for capacity of over 1GW shall remove correspond subsidy quota by local energy regulators. The table/figure show that excluding DG and poverty alleviation projects, cumulative PV capacities by 2020 will be roughly equal the total of provinces’ targets under their the 13th Five-Year Plan (red line). The total amount of DG and poverty alleviation projects is estimated at 15GW a year during 2018-2020, topping 65GW by 2020. Therefore, total accumulated installed capacity will approach 250GW, compared with near 40GW of average annual demand in the coming years. Given China annual output of 70GW a year and 40GW annual domestic demand, plus reserved capacity and export, a new wave of capacity expansion can be expected. According to threshold for module efficiency published by the NEA the other day, effective 2018, mono-si and multi-si modules will have to meet 16.8% and 16% efficiency, converted to 275W and 265W, respectively. Expanded capacities will be for standard to high-efficiency products, while capacities with backward technologies will be gradually excluded from ground-mounted PV projects and shifted to DG projects, poverty alleviation projects, plus overseas markets. Shortfall for PV subsidies has deteriorated, as evidenced by the existence of deferred payment for subsidies. Despite suspension of new installation plans for some provinces, the problem of PV electricity curtailment is still serious. For the large-scale of the target indicators, financial and grid problems still overshadow China's PV industry. With absence of RPS policy, green-certification transactions, scheduled for inauguration in 2018, will be unable to solve the financial predicament effectively. Reduction of FIT subsidies and deadline for grid connection has triggered the “630 installation rush” in 2016 and 2017. EnergyTrend predicts that a similar situation will reoccur in the next three and a half years. Yearly demand and the distribution of installation for grid connection will be determined by changes in FIT subsidies and grid-connection deadline.